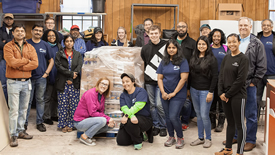 UNC Charlotte’s Jamil Niner Student Pantry recently received 1,200 pounds of food and supplies as part of TIAA’s annual employee food drive. The student pantry assists UNC Charlotte undergraduate and graduate students in need, offering a variety of nutritious meals and food staples to help ensure their continued success. “I am on my way” is what one will hear from Spence Guffey when he responds to a request for technical assistance in the Cone University Center or Popp Martin Student Union. 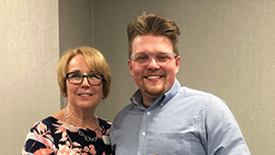 Guffey, a computer science major and sociology minor, is the 2019 Student Employee of the Year. He has served in a variety of technical positions since November 2016. Laura Pipe, director of the Teaching Innovations Office at UNC Greensboro, will present “You’re Coming in Hot: Active Learning Strategies for the Inclusive Classroom,” during the Active Learning Academy Spring Expo on Wednesday, May 1. 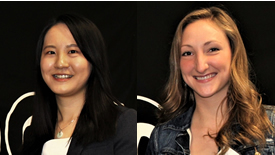 Yuehan Shao, who is working on a Ph.D. in applied mathematics, and Katie Wilkers, a master’s student in kinesiology, were named Outstanding Graduate Teaching Assistants for 2018-19. 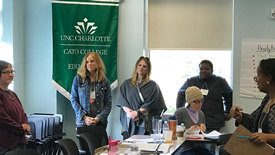 The Exceptional Children's Assistance Center (ECAC), in collaboration with the Cato College of Education’s Department of Special Education and Child Development, recently presented a daylong free training for parents of children with disabilities. 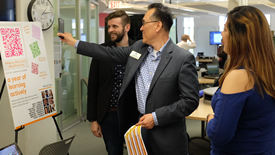 Ely Portillo, a longtime reporter for the Charlotte Observer, recently joined UNC Charlotte’s Urban Institute as assistant director for outreach and strategic partnerships. He will oversee the institute’s online engagement activities, including its coverage of regional policy issues and the dissemination of research findings. 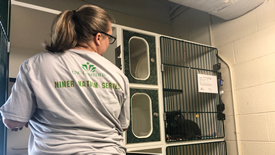 It was a busy week for UNC Charlotte employees who used their paid community service leave to volunteer across the campus and city of Charlotte during National Volunteer Week, April 8-12. Stevie Wall, Police and Public Safety, needs shared leave donations. The Benefits Office will accept donations through April 26. 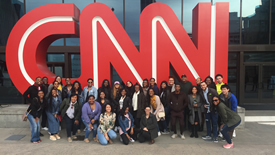 Experiential Learning Trips, an initiative offered through the Office of Identity, Equity and Engagement, enable UNC Charlotte students to explore the histories of various cities. Recently, 31 undergraduates visited Atlanta to better understand the unique aspects of Georgia’s capital. 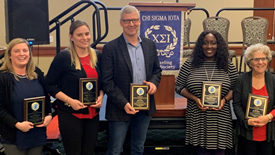 The UNC Charlotte Mu Tau Beta chapter of the international counseling honor society Chi Sigma Iota recently honored three outstanding graduate students and two faculty members in the Department of Counseling.